Standard Chartered launched video banking in Nairobi today. Already used in Asia, Kenya will become the first of their banks in Africa to roll out the service to its customers. Standard Charted is currently Kenya’s 5th largest bank by assets, and has been in the country since 1911 and serves retail, corporate and institutional clients. CEO Lamin Manjang spoke of their “digital by design” investments, in which they use technology to enhance customer experiences while improving on the banks’ cost efficiency. He said “ Almost all transaction done at the branches are available through other means” and listed recent innovations they have done including – upgraded their platform, a new mobile banking app, fingerprint login, ATM’s that accept cash deposit ATM, and now video banking. Whether in Singapore or Malindi, customers will be able to have secure video chats with agents located at the banks’ headquarters in Chiromo, Nairobi, share screens, exchange documents, do their banking and get advice, especially on investment and wealth management products and services. It is available to all customers, Monday to Friday from 9 a. to 6 p.m. Video banking is currently only on desktop computers, but they plan to extend it to mobile devices in the future. This entry was posted in bank service, Kenya ICT, SME solutions, Stanchart on May 16, 2017 by bankelele. 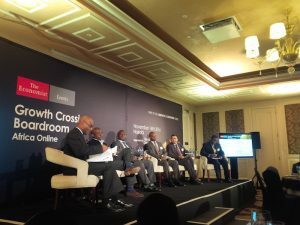 Excerpts from the Economist Events #GrowthCrossings dinner in Nairobi this week. A mobile network is many things in Africa, and Safaricom will be an ecosystem for others to succeed e.g in health, education, energy – Stephen Chege. E-commerce is driven by high volumes, consistent delivery, and consumer protection – this takes a lot to succeed in Africa – Sanjay Rughani. This entry was posted in Kenya economic growth, Safaricom, SME solutions, Stanchart, World Bank and tagged Africa, Africa Rising on November 18, 2016 by bankelele.